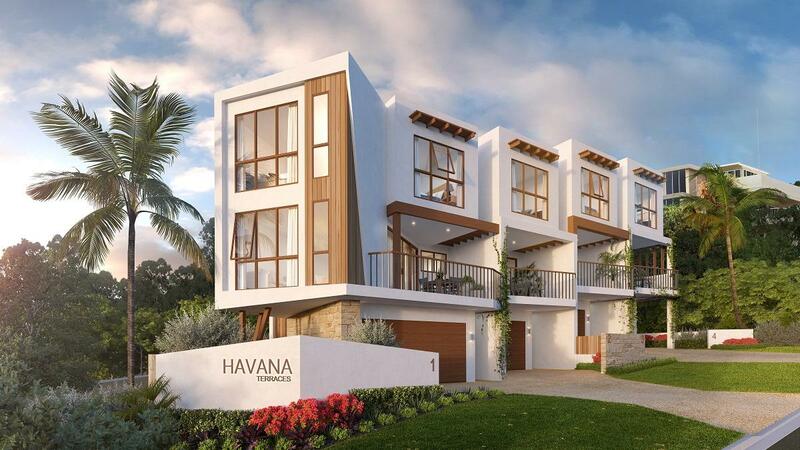 Havana Terraces is a boutique development inspired by the charm and romance of Spanish influenced architecture. Situated in the heart of the sought-after beachside suburb of Tugun, the project features four, tri-level terraces homes, each with three bedrooms, two bathrooms plus a powder room, study nook and two secure car spaces, with three offering an additional multipurpose room. Offering spacious and sophisticated layouts, each terrace home is uniquely individual featuring enormous gourmet kitchens with quality European appliances. Each home is orientated with a north-easterly aspect from all living areas, balconies and master bedrooms to capture maximum natural light and ocean breezes. Each home is fitted with ducted air-conditioning and fans in bedrooms and living spaces as well as stylish, large windows offering gorgeous, light-infused spaces throughout while still ensuring residents ultimate privacy. Steps from one of the Gold Coast’s most stunning beaches, Havana Terraces is just a short stroll to beachside cafes, restaurants, cocktail bars, Tugun Surf Life Saving Club, Currumbin Surf Life Saving Club, the gorgeous Currumbin Estuary; a place to walk your dog, enjoy an afternoon swim or surf at the world famous Currumbin Alley. Havana Terraces is less than a five minute drive to the M1, Gold Coast Airport, John Flynn Hospital and Palm Beach, 20 minutes to Robina Town Centre and just 25 minutes to the heart of Broadbeach, Pacific Fair Shopping Centre and Star Casino.